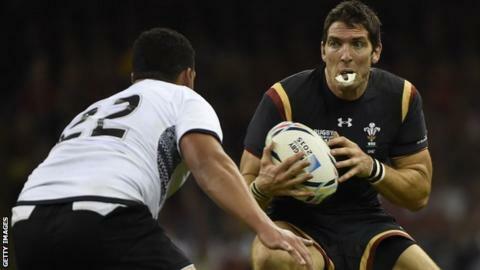 Wales are determined to avoid another narrow loss to Australia in Saturday's World Cup Pool A decider, says James Hook. Wales have lost 10 matches in a row to the Wallabies, but each of the last nine have been by nine points or fewer. They meet again at Twickenham on Saturday to determine who tops Pool A. "The boys have spoken about how much heartache we've had against Australia so we have to go in with huge motivation," said 30-year-old Hook. "Everyone is beatable, it's just about getting it right on the day." Australia won a thrilling match 33-28 in Cardiff the last time the two sides met, on 8 November 2014. In keeping with many of the previous recent encounters, Wales led going into the final stages but failed to hang on for victory as fly-half Bernard Foley landed a drop-goal and a penalty. Foley, 26, was again the match-winner last Saturday in Australia's 33-13 win over England. He scored 28 points as Australia guaranteed their place in the last eight, with Wales also going through at England's expense. Hook said: "You expected Australia to play well, but not as well as they did. "A lot has been made over England being bad, but a lot of credit has to go to Australia. Injured centre Scott Williams says Wales must stay &quot;switched on&quot; to avoid another agonising defeat against Australia in the World Cup. "We're delighted - it was a great favour to us. It was probably the first and last time I've supported Australia. "They were brilliant on the day, they have so much experience and quality in their team so it wasn't really a surprise." Hook was initially overlooked by Wales, but was called up after they lost centre Scott Williams and winger Hallam Amos to injury during the win over England. The Gloucester fly-half's versatility across the back-line means he is likely to be involved in Wales' matchday squad against Australia, and says there will be no lack of self-belief that they can finally end the losing run of results against the Wallabies. "Momentum is huge, and the Wales win over England was massive," he said. "You can see the confidence in the boys since I've arrived. This is another big test this week and then in the quarter-finals, and hopefully we can do something special." Wales and Australia name their teams on Thursday.